Central urban MICE with quick access from Haneda Airport. Set in a large green park, this area offers a taste of the deeply moving Tokyo experience. Shin Yokohama continues to develop as the new face of cosmopolitan Yokohama City. The historic and cultural city of Kyoto represents Japan to the world. 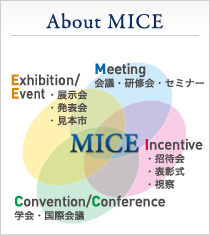 "Resort MICE" unique to the area of Karuizawa have a global appeal. Sapporo is full of after MICE attractions, sports that can be enjoyed in the great outdoors. Copyright © PRINCE HOTEL,INC. Allrights reserved.